Solid conditioners are a very new concept for me - never seen one until I picked the Jungle Solid Conditioner at a Lush store. As far as I know, this is the only solid conditioner that Lush makes though they do make a lot of solid shampoos and shampoo-conditioner combination bars. 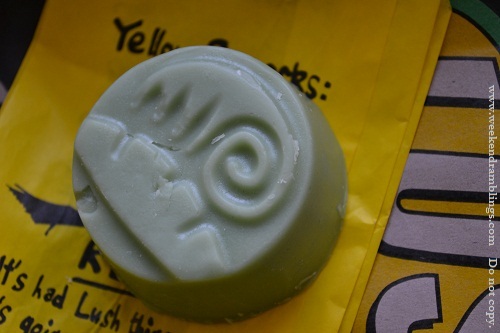 Here's what Lush says about the Jungle solid conditioner bar: Contains five different fruits. Jungle feels different on your hair from liquid conditioner; until you wash it off, you hardly notice it's there. It smoothes and detangles, leaving a fruitily scented coat of shininess. Smooth it along the length of your hair from root to tip, then rinse out. Cocoa butter will slide on to your hair to make it softer, then dissolve in water to leave it shiny and smooth. How to Use: Wet the conditioner bar and smooth it on - not rub it any which way - but just slide it over wet hair. Leave it on for a while and rinse off. Important thing to remember is to make sure the conditioner bar is wet or you might end up breaking off some hair that gets stuck to it. It smells amazing - kind of a fruit-floral smell mix that I find AMAZING. 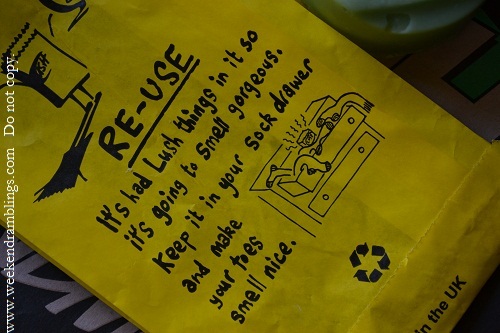 I leave this in the bathroom, and the whole place smells great. The smell stays on my hair for a long while after each wash and I just love it. 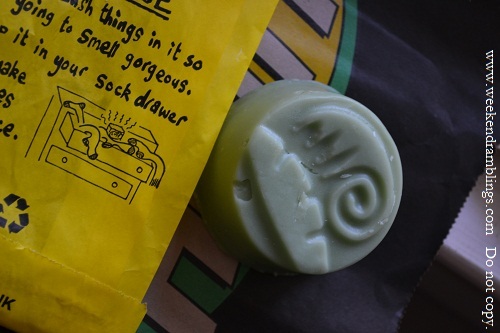 One conditioner bar lasts forever, well almost forever - I have never ever really finished a whole Jungle bar. The last time I bought it, I shared half with my friend. The remaining half lasted and lasted until it fell down a drainhole or something..I forgot how I lost it - all I remember is I never actually saw it getting over. It's perfect for dry frizzy/thick hair - doesn't feel too heavy when you put it, but the cocoa butter in the conditioner does a fabulous job of settling down hair, especially with static. I have shorter length hair, so this is not really a problem for me, but my friend who has longer hair complains that hair gets tangled in the bar and gets broken. One way to avoid it is to ensure the bar is wet while rubbing it on hair. Keep wetting it and then smoothing on the hair. Also, ensure that you just smooth it one direction - not just smear it haphazardly and get a tangled mess around it. Figuring out just how much to use can be a bit of trial and error with this product. I have been using this for a while now plus I have roughish hair, so most times I don't go overboard with this, but it is very easy to and end up with greasy looking hair. Ensure that you keep the bar standing out of water (like in a soapdish with draining holes) or it can melt away pretty fast and get wasted. Soya Lecithin, Fresh Figs, Fresh Bananas, Fresh Passion Fruit, Fresh Kumquat, Fresh Kiwi Fruit, Cetrimonium Bromide, Ylang Ylang Oil, Vetivert Oil, Cypress Oil, Sandalwood Oil, Chlorophyll, Limonene, Linalool. Overall, this is a great inexpensive product from Lush. It is a solid bar, so no hassles with travel - no leakage/accidents - and don't have to worry about airport security either. It does take a bit of a practice to figure out how to use this, and I won't recommend it to people with thin, fine hair since it can weight hair down. Nupur..it is cute..but me ignoring you hmmmph. Hi Rads...am basically new to Lush products, but your reviews help a lot. BTW, loved your ring post, left a comment for you there! I sawwww...replied..hey Sabrina..I forgot to reply..but I will definitely check out the thing you asked me to check out when I go shopping next time. Thanks Rads - you mean the nail polish corrector pens, or what I had requested you to check out, in my email?? I was so tempted to try these but thank god u said it is not for thin hair :) Im skipping this for sure. Ya it might weigh hair down and make it look like oily kinds..you liking the Lush things you picked up? I dont like difficult to use thgs..as I am always in a rush..so solid shampoo n conditioner is nt for me..